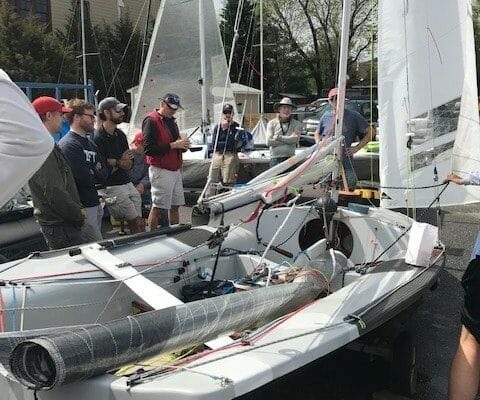 Great turnout with 13 teams registered (details below), new-to-owner boats, new faces on the water, and new prospects! 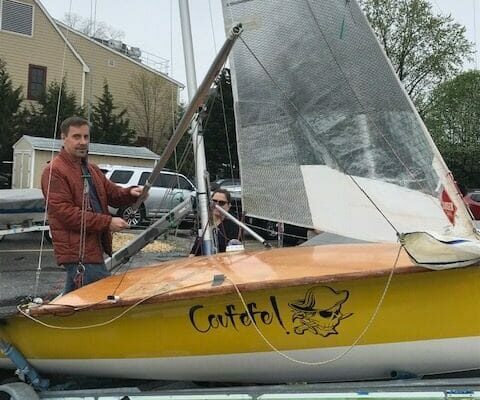 But some great 505 sailing Sunday afternoon. 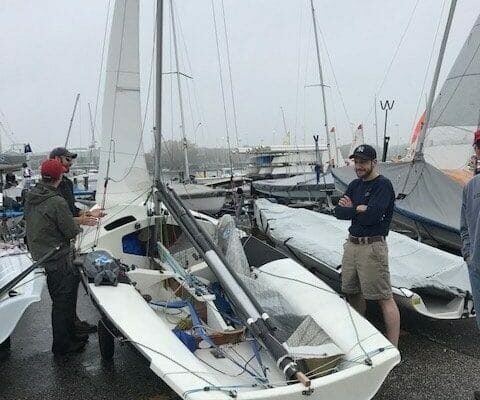 We were postponed ashore all Saturday with very light wind and fog. 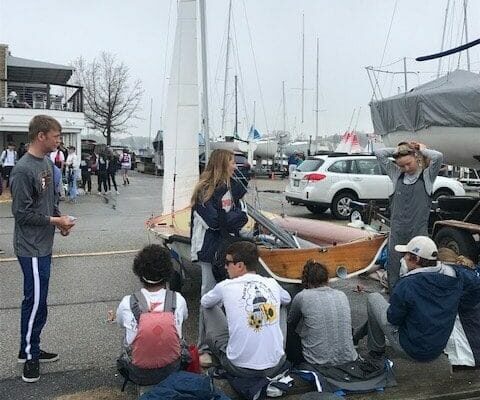 The high school event was racing short courses off the Naval Academy wall, but the fog was “socked in” further out. I don’t think I ever saw the shoal pole from SSA on Saturday. The fog eventually lifted and there was some breeze in the late afternoon, well after we abandoned for the day. Sunday was supposed to be better but was still fogged in. 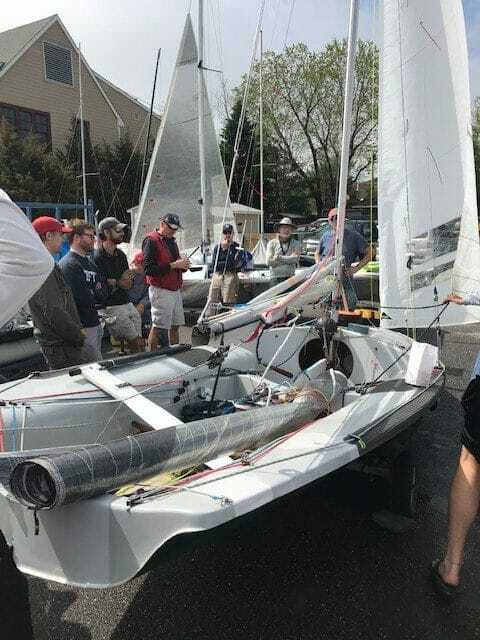 Racing was abandoned after being postponed on shore, perhaps because of the Soling fleet (Soling US Nationals) racing cut off of 13:00 (1:00pm), but within minutes of that, the fog cleared and the breeze filled in. 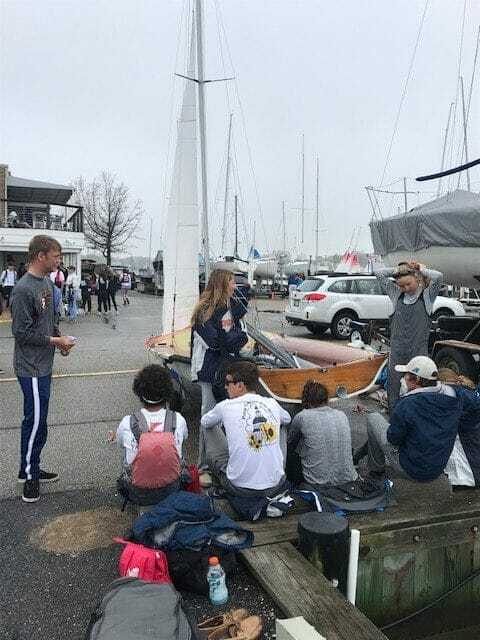 Five teams: Macy Nelson/Nate Barton, Chase Hillyer/Chris “birthday boy” Brady, Len Guenther/Mike Renda, Ashley Love/Ali Meller and Jordan Bruce/Marcus Adam in the Severn School 505, launched and had a really good time lining up upwind and down. TPLM2 reports 12-17 knots for the noon to 4:00pm period. 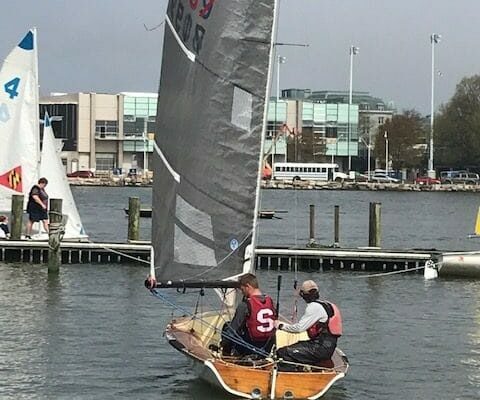 Macy/Nate had the best pace upwind (they would have to ease up shortly before bearing off to hoist the kite, to let others close up with them) with Chase/Chris usually second best upwind though Ashley/Ali were in there as well a couple of times. 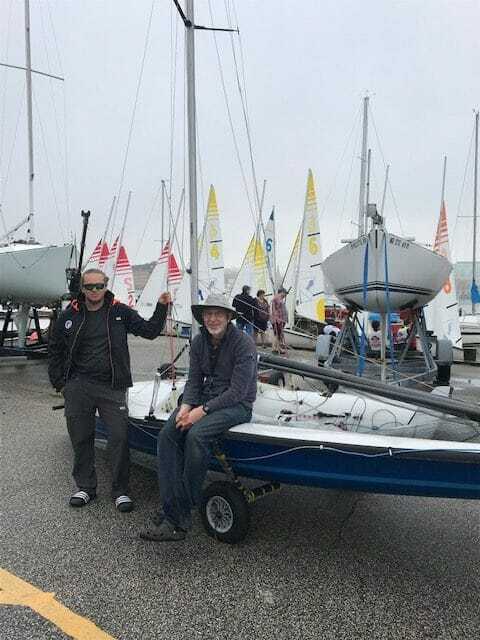 Downwind Ashley/Ali were able to use their lighter weight to work a little lower before the gybe from starboard to port and were looking good on some of the runs. But then they were racing to the green can each time, and it wasn’t clear that was where the other teams were trying to get to. At least two teams splashed it in for a swim. How was the water? Ashley/Ali were raked a bit more than 2″, a little beyond 3′ 6″ (using the forward measurement) so perhaps at 25′ 4″ or 25′ 5″ if measured aft. We left our shroud cars somewhat forward, looking for some mast bend to flatten the main. We had lots of shroud tension to reduce jib luff sag. 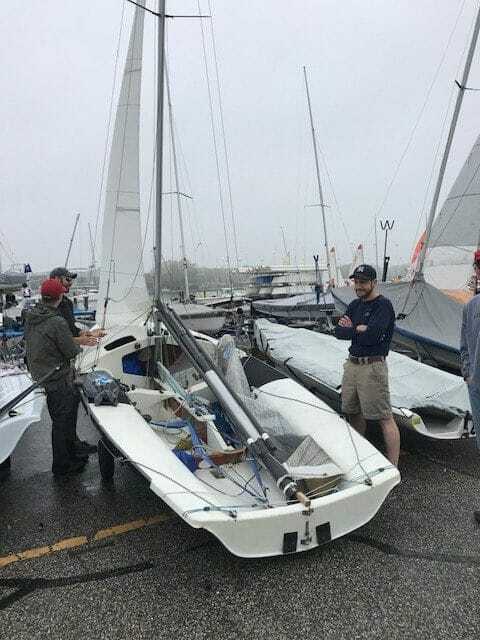 I tried to sheet the jib hard in while checking with Ashley that the boat still felt OK. We rammed down a fair bit, and had a mast that looked fairly straight down low, and a significant and somewhat even bend above the gooseneck. The CB was vertical or very slightly up. 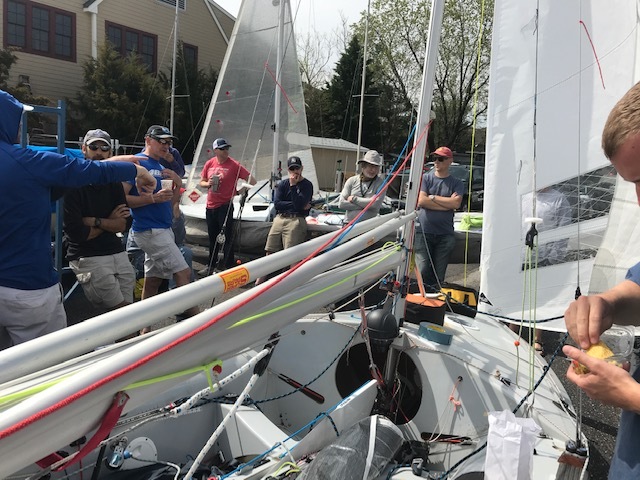 I kept calling for more vang… but with a slightly tired Dacron mainsail and a fair amount of mast bend, you simply cannot get the upper leech to stop twisting open a bit. 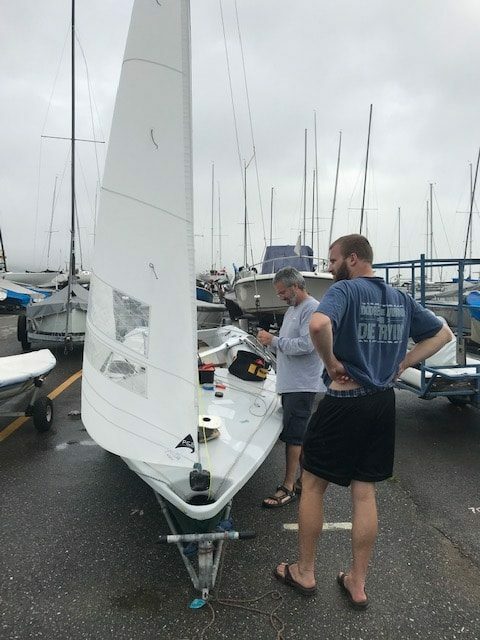 We were not pointing high at this setting, and still had the boom outboard of the transom corner some of the time, but we were hanging upwind. Macy/Nate were pointing lower, were going through the water faster, and usually gaining by doing so (lower/faster/net to them). They were also flatter than the other teams, sailing upwind. 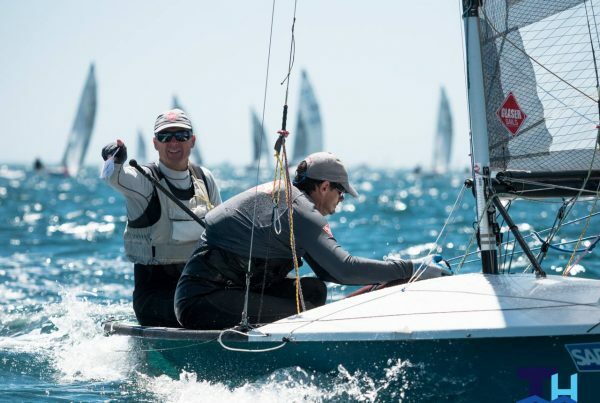 Does anyone else have any thoughts about tuning/settings/boat handling/other arising out of the Sunday afternoon session? But Geoff and Jimmy managed to register twice, and Dave B. and Jesse did not make it out. 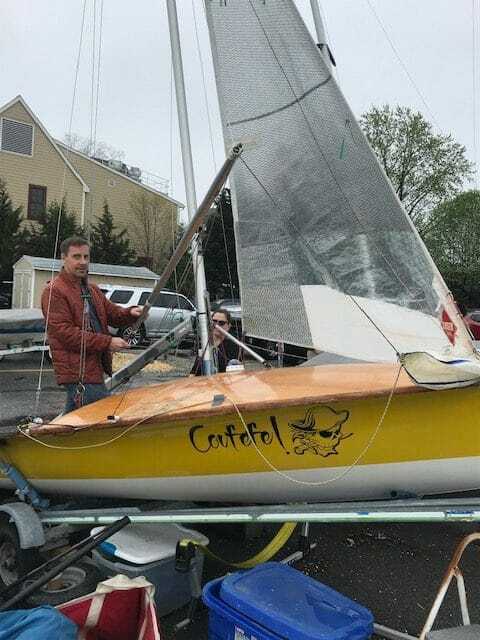 Paul Andron bought Brendan Connell’s Waterat and was ready to race on Saturday (great boat for Paul!!). Marek Balinski came down from Toronto and was teamed up with Carlos Linares. Chris Brady had Chase Hillyer driving. 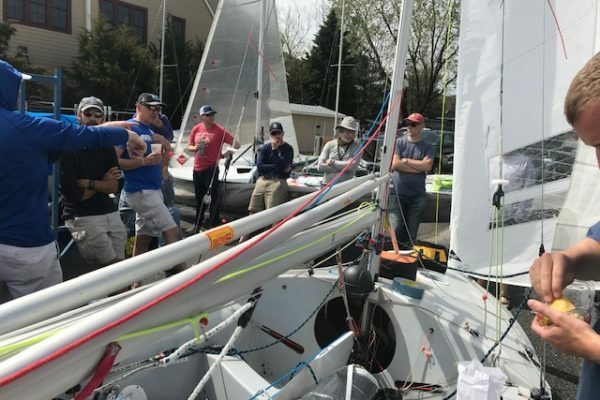 Geoff Gales was going to sail with Jimmy Praley (despite registering separately), Barney Harris was teamed up with Raymond James Bay, Eric Konieczynski was crewing for Kyra Tallon, Ashley Love was driving Mike Coe’s 8841 (using 9200/7200 mainsail) with Ali Meller on the wire. Macy Nelson was teamed up with Nate Barton. 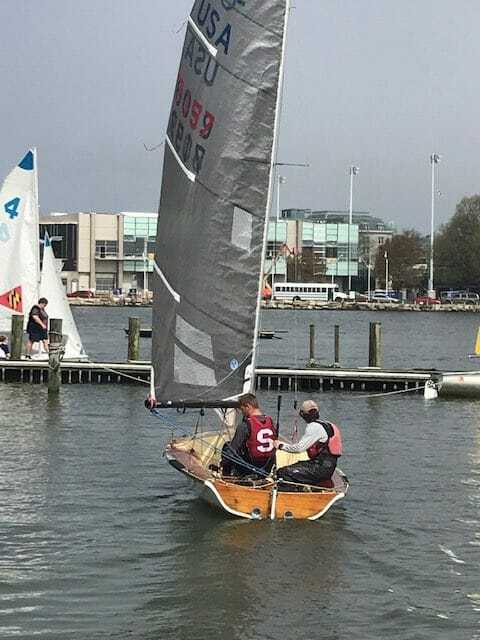 Mike Renda had Len Guenther driving, and high school sailors Jordan/Macrus borrowed the Severn School Lindsay. 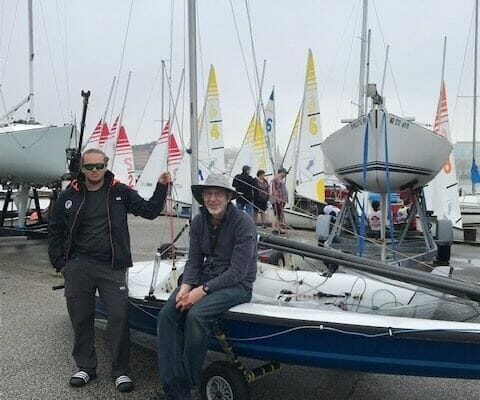 After we sailed in Sunday, I met James Golden. 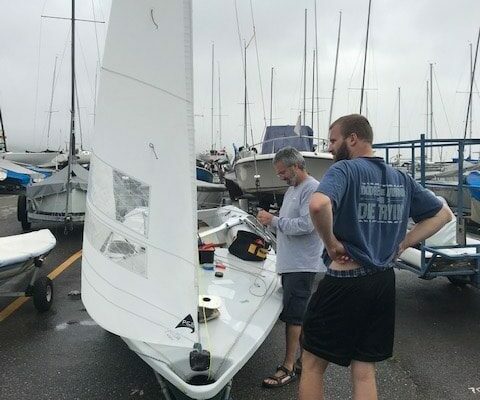 James is a high school sailor very interested in sailing/racing 505s. He has trap experience and is about 180 pounds. James is copied on this email.